I learned to weave 6 years ago. I took a one day workshop which not only introduced me to the steps involved in weaving, but also offered an opportunity to try various types and makes of looms. After that came classes in basic twills, an Atwater-Bronson lace shawl, and doubleweave. Online Guild workshops have included tapestry weaving, triloom weaving, and an introduction to overshot. However, I always felt that I was missing something by this haphazard approach to learning weaving. 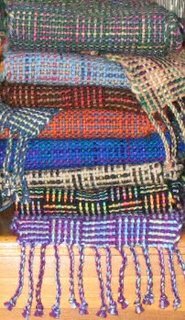 It was an Online Guild member who mentioned that she had learned to weave by working her way through Deborah Chandler's Learning to Weave. This sounded like a good idea to me, so I have adopted this plan in hopes of filling in the both my experiential gaps as well as my knowledge gaps. I decided to start my organized approach to self taught weaving with the log cabin structure. 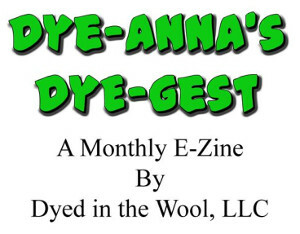 Having seen several examples which used space dyed yarn and because of my love for color, I wanted to do the same. I've been working through a variety of color combinations with a series of scarves. One of my biggest frustrations when I started weaving were getting the tension even (welcome to the club, right?). I have woven miles of smiles in regards to fell, and miles of frowns in regards to my face! The thing that helped tremendously was learning to lash the warp on to the front apron rod instead of tying on. Peg introduced me to this method a couple of years ago, and after a little practice I discovered it was much easier to achieve an even tension with this method. Things improved quite a bit after that, though I still admit that I have occasional problems. One new thing I decided to try with this series of log cabin scarves is the way I join a new weft. I've tried overlapping and tucking in, but wasn't completely with the visible results. I've also tried simply leaving weft ends hanging out of the selvedges to be cut off later, but never felt very secure with that, unless the fabric was to be used in a sewing project. I never tried unwrapping the plies because that seemed too fussy, but decided to give it a try anyway. Now I am finding that it gives the nicest visual results, so I'm happy that I gave it a try. I see that you have joined a lot of us out here in blogland. I also see that I influenced this activity on your part. Guess it worked! Anyway, glad the lashing on works (usually.....) for you. You do know, that if you really get into the possibilities of log cabin, there is shadow weave to explore. Variegated yarns would be fabulous there. Yes, splitting yarns does make the really neatest join. However, there is one that is pretty good and much faster. When you run out of thread at the end of a shot, put that thread into the next shed for 1/2" or so. Then throw your new bobbin full of thread and let that hang over the edge and cut it off close to the edge after you have woven awhile. Will also try your suggestion for attaching a new weft yarn. Leigh, we travel the same path I see...yet again. My problem when lashing on is tying on at the end. I go around the rod a few times and then tie a series of what I suppose are slip knots. And slip they do. Thus my problem. 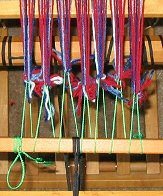 (I've even pulled up a long loop and then made bonafied knots) The warp seems to be evenly tensioned at first, but after a few feet or a yard, the tie off end side begins to slacken. Oh wise one, words of wisdom? And in answer to your question, about my question, about your jugs for warping? I didn't see them so thought you had "gone to the other side".